Common condominium projects may include retail outlets or commercial units but Iconic Skies Condominium and Villa in Relau is truly an unique development. With two condominium towers standing at 37 and 35 storeys, the development also has 14 villas connected to it. The project by Iconic Land Sdn Bhd will be featured at the upcoming Star Property Fair 2014 at Queensbay Mall. One of the main attractions of the condominium is its low-density development with only 299 units and up to four different layout types for prospective homeowners to choose from. The smallest layout at 1,483sq ft is the corner lot with three bedrooms and three bathrooms, suitable for middle-sized families. Those with larger families, however, can opt for the sprawling 2,976sq ft dual key unit with four bedrooms and five bathrooms or the 1,598sq ft layout, with three bedrooms and three bathrooms. The Skies Villa on the other hand comprises three-and-a-half-storey abodes complete with a private lift. There are two types to choose from — the 3,463sq ft intermediate lot and the 3,578sq ft corner lot. Both types offer access to the facilities podium through the ground floor. Furthermore, there is also a private garage, offering parking convenience. With four bedrooms and five bathrooms, Skies Villa homes offer elegance and luxurious living space. Each villa also has a roof terrace, giving residents a place to unwind and admire the night sky. The recreational facilities provided include an infinity pool with whirlpool baths, a floating pavilion and steam rooms. There is also a leisure deck connecting the two condominium towers together, set to wow residents with a heated whirlpool bath that offers a panoramic view of the surrounding nature. 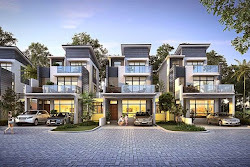 An added bonus to the development is its strategic location in Relau, conveniently located near the Penang International Airport, the Penang Bridge and the Sultan Abdul Halim Muadzam Shah Bridge. The project is expected to be completed in mid-2017 and the units are selling fast. Iconic Development also has a commercial project known as Iconic Point and a residential scheme called Iconic Maison 88 in Simpang Ampat. Iconic Point offers 10 units of three-and-a-half-storey semi-detached shop offices complete with a private lift. Iconic Maison 88 showcases 88 three-storey super-link homes. Visitors can learn about the attractive promotional packages offered by Iconic at the fair from Oct 23 to Oct 26. It will be open from 10.30am to 10.30pm daily and entrance is free. A total of 17 exhibitors will be taking part in the fair which will be held for the second time this year. The booths will be spread out in Queensbay Mall’s north, central and south atriums. how much are they selling it ?